Adults still have tantrums, too. I mean, there are rarely tears streaming down a colleague's face with snot and fists tight, seething because he or she is overtired. But, as adults, we still fall prey to all the same things our kids are learning about daily: frustration, anger, disappointment, competitiveness, a growing sense of self-worth, jealousy, fear, shame, and loneliness. Sure our tantrums are not rolling around on the ground, yelling and hitting our fists, but does this sound familiar? You and a co-worker have the same responsibilities, but routinely, they do not complete them, and you are left to make sure things get finished. When you address it and ask, "Did you know you were supposed to do this?" Perhaps they say well, sure, but no one is really going to make me, so why bother? Translation: Nanny Nanny boo boo, you can't make me! A friend has been MIA for sometime, and upon reentry into life, it's hard to miss they have undergone a drastic change which enhances their appearance. Everyone wants to talk to them. To their face, the friend gives a compliment, but after he leaves, negative comments fly in the group. "It totally isn't natural, if you know what I mean." Translation: You can have that toy, I didn't want to play with it anyway!!! It isn't a seamless comparison, but the point is that adults aren't perfect, we still make mistakes, and we are not that great at regulating our emotions even when we know better. The hard part about emotions is that they are real. Whenever we feel them, and in whatever form they take, they are real. Telling them to go away rarely ever works. And as adults, this is with the benefit of having a fully developed frontal cortex that helps regulate our feelings and reactions! When you have an 18-month old who does not want to wear gloves, it is tough to help them understand that in the winter in Maine, they need to wear gloves outside! Or, the daily trial of your child wanting something, and being frustrated they can't have it. They are trying our nerves, but they are also trying. Trying out new skills. Trying out sounds and words. Trying out new choices and seeing what happens. But when our kids get to the point where they are in a tantrum, it isn't like talking to an adult who makes a snide comment to a co-worker - you can't change their behavior by calling them on it. In fact, you can't do much. I had no idea what it meant to love someone through a meltdown until I experienced it. It was the first time I could see that my child had zero connection between her brain and her body when she was flopping on the floor. There was nothing but anguish. It wasn't done with malice. She didn't have a goal in mind. She didn't even remember what the problem was in the first place. She was overwhelmed, and I had a choice: I could leave her there to go through it alone, or I could stay and go through it with her. It just so happened that day I had patience. It just so happened on that day I was rested, and able to turn off my parenting lessons, and I could sit with her while she was mad and sad. Young children are not giving us a hard time. They are having a hard time. And any logic that we would use on another adult simply won't work, and it isn't appropriate. Our kids are not co-workers, or friends, or strangers we meet in the community. They are future adults who have no clue how to exist in the world, and we are the people who help them. Some days, we can say, "Please get down off the table." and they get down off the table. Easy! Some days, they stomp and scream, and buck when we move their body for them back onto the floor. "Wow, it sounds like you have some big things inside you that need to get out. Do you need a hug?" Bringing home a new baby can be emotionally and physically challenging. But the challenges don't end there. Your relationship is one of the areas that tend to need the most TLC when you're adjusting to life as a new family. In the awesome book Babyproofing Your Marriage: How to Laugh More, Argue Less and Communicate Better as Your Family Grows by Stacie Cockrell, Cathy O'Neill, and Julia Stone is an awesome guide to the different challenges parents will face along the way. They cover everything from in-laws to intimacy, to help couples who might be struggling to reconnect and maintain their spark. We plucked a few of our favorite "stages" and words of advice from the book to throw some refreshing tips your way to living happier as a married couple with kids. Once the hospital sends you and your new baby on your merry way, the panic sets in. There's a moment when parents look at each other terrified and admit that "they're not so sure they can do this." A bunch of irrational fears and paranoia start to drive the wedge between parents. Luckily the first few weeks are anything but lonely, with a parade of friends and relatives coming in and out of the house to lend a hand with the baby. Like all good parades, this too will come to an end. Once the relatives leave, parents are back to square one and have to figure out what to do next. Talk about stressful. But knowing what to expect in your first few weeks postpartum will help parents relax and work together as a team. Sometimes a new baby feels less like a joy and more like a full time job. Your boss just happens to be a very cute but relentlessly needy new baby. New parents are prepared for some sleepless nights, but it's one of those things you just don't know what it's like until you're on the front lines. When parents are tired, they're stressed and consistently cranky. A cranky spouse is sure to build quite a divide in the relationship, making the first few months particularly tough. Remember when fights were as cute as what to eat for dinner or why you didn't get a call back right away? Those days are long gone and most arguments from here on out tend to be a little more aggressive. The stress of transitioning into roles as parents can create a lot of tension that makes communication more important than ever. It's a crazy journey, but an amazing one. The Baby-Proofing Your Marriage book is an awesome read for any parent who might be feeling a little stressed out as they settle into life as a brand new family. As your little one gets older, bath time can become a daily battle for parents. When you're trying to bathe a wiggly toddler, it takes some serious reflexes and coordination. When you incorporate some fun bath time activities, bath time is easier for parents and safer for baby. We gathered together some of our favorite products and activities to make bath time actually a fun way to wind down the day. Don't get too upset if your fun bath time isn't picture perfect, there's no creative parenting judge. Anything that can bring a little more whimsy to bath time will be appreciated by your kids and make the whole process easier on you. 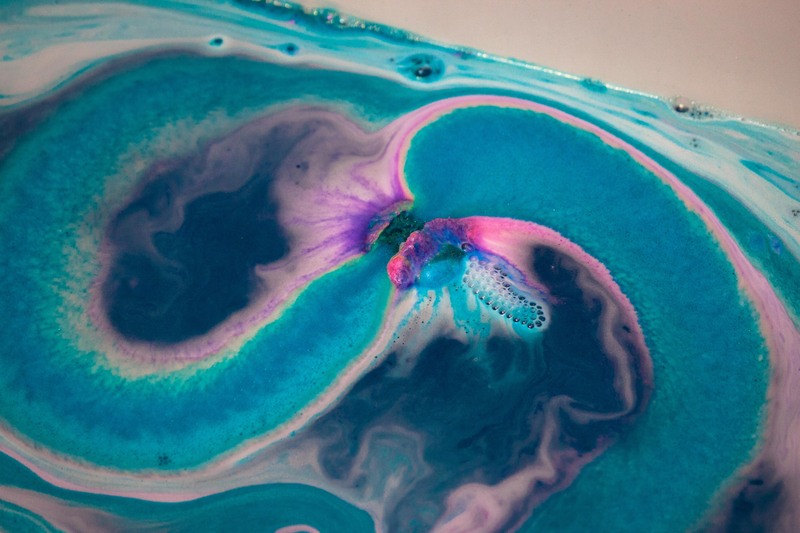 LUSH's Intergalactic bath bomb in action. The popular all natural cosmetics brand LUSH is famous for their hypoallergenic and fresh ingredients. Aside from their bath bombs that explode into a rainbow of colors, they've also been hard at work trying to make bath time a little more fun. Who doesn't like play dough? You can't exactly build a play dough pizza in the bath tub, but with LUSH's fun you can! They've engineered a malleable dough that can be used as bubble bath, shampoo, soap and sweetly scented sculpting clay exclusively for bath time. What can make this brand better? LUSH is a huge advocate against animal testing, only uses sustainable ingredients and donating to charities. With every roll of "fun" sold, part of the profits are sent to build playgrounds and safe recreation spaces for children in Japan. Sometimes simple is the way to go. With the help of some plastic kitchen utensils like colanders, plastic spoons and measuring cups can transform a bath into sensory play time. Plastic colanders of different sizes make fun "rain clouds" with fun patterns of water. Measuring cups and spoons can help your crafty toddler make a big bowl of soap soup. Little kitchen gadgets can help distract your little ones long enough to wash their hair without any complaints or fussing. Fill the tub with different size containers and utensils with your LUSH bath bomb and you'll be able to make bath time fun with plenty of aromatic oils to relax your little one before bedtime. Nothing captivates kids more than glow sticks. One of the coolest bath time accessories is floating a handful of colorful glow sticks into the tub and dimming the lights. The bath water will light up incredibly bright and your toddlers can explore a neon scavenger hunt in the tub. Dimmed lights will get them sleepy and glow sticks are incredibly difficult to break, making this a safe way to spice up bath time. Kick up your outer space theme with some homemade alien slime! Really it's just food coloring in some shaving cream, but your kids can paint the tub while you wash them up. If you're nervous about putting glow sticks in the tub for some reason, did you know that tonic water glows light blue under black light? Try picking up a couple bottles of tonic water from the grocery store and replacing your bathroom vanity bulbs with some black lights. Just be careful, these black light bulbs tend to get extremely hot. Who said bath time has to be boring? With a little help from some toys and homemade bath accessories, you can have an awesome bath adventure that will make bath time fights a thing of the past. Try switching it up for holidays, events and heading to sites like Pinterest for a little bit of inspiration for crazy bath adventures for every age.